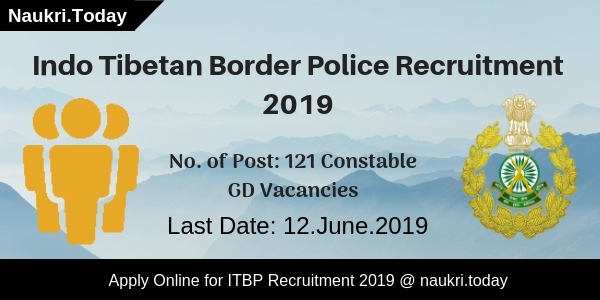 ITBP Recruitment 2019 – Indo Tibetan Border Police has published notification for 121 Constable GD Vacancies. The Department is going to appoint on a Temporary Basis. Interested aspirants may fill up their application form before the last date 21 June 2019. The Online Registration will be started from 22 April 2019. Participants who have a matriculation certificate may fill up their application form from here. General and OBC Category aspirants have to deposit Rs. 100/- as an examination fee. The SC/ST and Females category aspirants are fee form the payment of an application fee. What is the Important Dates For Filling ITBP Jobs Online Form? What is the Application Fees, Pay Scale & Selection Criteria For ITBP Constable Vacancies? How Much Pay Scale & monthly Salary for ITBP Vacancies? What is the Required Education & Age Criteria For ITBP Recruitment 2018? How Much Application Fee Required to Fill ITBP HC Online Form? Education Qualification Matriculation or Its equivalent degree from any recognized university. For more information candidates should check official ITBP Notification form link given here. Pay Scale Level- 3 Rs. 21,700 per month. Selection Process for ITBP Recruitment 2019 Document Verification, Physical Standard Test (PST) and Detailed Medical Examination. What Is the Physical Standard For ITBP Bharti 2019? Conclusion: Indo Tibetan Border Police Department has issued notification for 121 Constable GD Vacancies. Candidates may apply online for ITBP Recruitment 2019 before the last date. For more details, candidates should read the above article carefully. Dear Applicants, If you are looking for ITBP Constable Vacancy Notification then here is good news for you. Indo Tibetan Border Police Force has now released the notification for recruiting candidates on 85 Constable (Animal Transport) Vacancies. Those candidates who are interested in ITBP Recruitment 2018 can fill online form for Constable jobs from here. Closing Date for filling up ITBP Jobs Online form till the last date 13.11.2018. ITBP Police is inviting online form for filling up 85 Constable Vacancies. This is a good job opportunity for all the candidates who are waiting for ITBP Bharti 2018. Submission of online form for Indo Tibetan Border Police Jobs is starting from 15.10.2018. Candidates must check the required criteria for ITBP Constable Recruitment before filling the online form. Rest of the information about Eligibility Criteria, Pay Scale & Other Details you can check from below sections. Candidates who are searching Eligibility Criteria For ITBP Vacancies can check here. In the below section our naukri.today team is providing Required Education & Age Criteria for Filling ITBP Bharti Online form. You can also check this information from official notification. Candidates must be passed 10th (Matriculation) from the recognized board from ITBP Vacancies. Furthermore, details check official advertisement. Age of the candidates for ITBP Police recruitment 2018 must be in between 18 years to 25 years as on 13.11.2018. Relaxation in age for ITBP Bharti is applicable up to SC/ST/OBC/ESM category as per Department rules & regulation. Candidates of OBC/ UR Category need to pay Rs. 100/- as application fees for ITBP Constable Recruitment 2018. Other category candidates of SC/ST/ESM are exempted from paying application fees. Fees must be deposited through online mode. Selection of the candidates for ITBP Police Recruitment will be made on the basis of Department Exam Scheme. Patten of examination you can check from here & for more details you should read the official ITBP Jobs Notification which is mention below. Applicants who are interested & Eligible for ITBP Police Vacancies can fill the online form here for 85 Constable Posts. Here we are providing step by steps process of Filling ITBP Online form. First read all the steps properly & then follow while applying Online form for Indo Tibetan Border Police Recruitment. First of all, candidates log on to the official website www.itbppolice.nic.in. Fill all required information in the form properly. Upload your scanned photo & signature in the form properly. Recheck all details filled in the form properly. Conclusion : ITBP Recruitment 2018 For 85 Constable Vacancies. Candidates can fill online form for ITBP Constable Recruitment on or before the last date 13.11.2018. Check more details from official notification or from the above article. Are you looking for ITBP Head Constable Notification ??? If yes, then here is important news for you. Indo Tibetan Border Police Force is inviting online application form for filling up 73 Vacancy of Head Constable. Candidates can fill their online form either here or official site. All the Job Seeker who is interested in ITBP Recruitment 2018 can fill the online form here before the closing date. Last Date for submitting ITBP Vacancy Online form is 23.10.2018. For more information, you may require to read our full article. 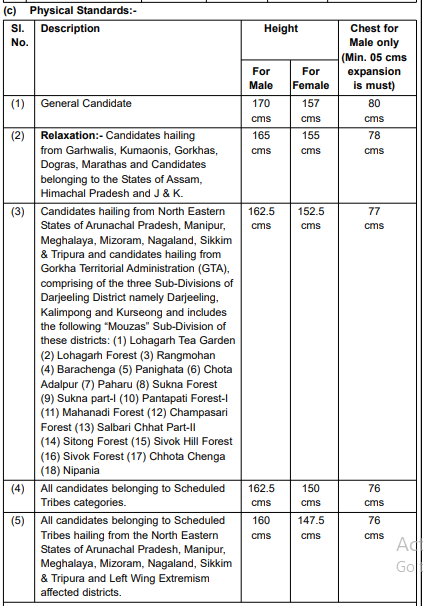 Indo Tibetan Border Police Force has published notification of 73 ITBP Head Constable Vacancies. This is a great job opportunity for all the candidates who are waiting for ITBP Jobs. Online registration for ITBP HC Recruitment 2018 starts on 24.09.2018. Applicants can fill ITBP Online Form till the last date 23.10.2018. For more information about ITBP Police Vacancy like Age Limit, Pay Scale etc. you can get from the below article. Applicants, you can check ITBP HC Recruitment 2018 Age Criteria & Required Education Qualification form here, Our Team is providing full information related to Eligibility Criteria ion the below section. Candidates who are going to fill online form for ITBP Recruitment 2018 should have passed Intermediate or Senior Secondary Examination (10+2) from any recognized University. Candidates must have knowledge of Typing English or Hindi on Computer. More information you can check from official ITBP Police Jobs Notification. Minimum age of the candidates for ITBP Police Vacancy should be 18 years & Maximum age must be 25 years. Age is relaxable up to 40 years for UR & OBC Category & 45 years for SC/ST category candidates for ITBP Recruitment 2018. Selected candidates for ITBP Vacancy 2018 will pay band Rs. 25,500/- to 81,100/- as per 7th CPC. candidates will also pay Other allowances for ITBP Police HC Vacancy as per Department Norms. Male Candidates of General/OBC Category need to pay Rs. 100/- as application fee for ITBP Vacancy 2018. Other Category & female candidates are exempted from paying the application fee for Indo Tibetan Border Security Force Recruitment. Selection of the candidates for ITBP HC Vacancy will be made on their basis of Departmental Exam Scheme which is divided into Three Phase Examination. Phase Wise Classification of Examination is mention below. Candidates can check Exam Syllabus & Other Details either from here or from official notification. Keep staying with this page for future information related to ITBP Jobs 2018. First of all, candidates visit the official website www.itbpolice.nic.in. Now click on Recruitment Section & click on ITBP HC Jobs Notification. Now click on Apply ITBP Online Form Link. Upload your scanned passport size Photo & signature in the ITBP Recruitment Application form properly. Recheck all filled details before submission. Now deposit Application Fee for ITBP HC Online form. Click on submit button & take print out for future use. Conclusion : – ITBP Recruitment 2018 for 73 Head Constable Vacancies. Interested candidates can fill the online form here for ITBP HC Recruitment from here before the last date, that is 23.10.2018. I am gurpreet Singh from tarn Taran Punjab .I am sc caste. My father name s. Jaswant Singh .